In restoring my 1958 Chrysler 300D I wanted to put the exhaust pipe and muffler hangers back on the car as originally as possible. Either buy NOS ones or restore the old ones. It has turned out to be some work. I have not been able to find NOS ones so I started cleaning up and evaluating the originals. It began with a muffler hanger. 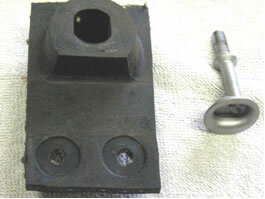 The rubber portion of the hanger had completely separated from the clamp portion of the hanger but both pieces were there. I carefully removed the rivets that held the rubber portion in place. Then I drilled holes in the center of the rivets. I was then able to use a couple of 10-24 self tapping screws to screw into the rivets joining the pieces together. It looks original and correct. I located an NOS hanger that used the same upper part but with a different clamp on the bottom. The finished product mounted on the frame. 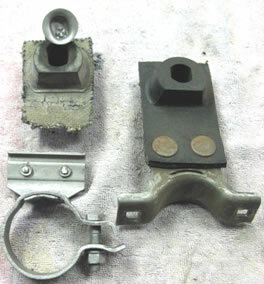 Original hanger on left, another hanger on the right NOS Hanger separated from its clamp. 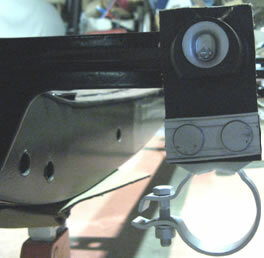 Note special hanger bolt on right.